The Heartland Institute, a conservative and libertarian public policy think tank founded in 1984, held its Third Annual Picnic for Freedom on Saturday June 2 to share some of its accomplishment of the past year and to celebrate what is yet to come in the years ahead. The event marked nearly the one-year anniversary since Tim Huelskamp, Ph.D., took over the reins of The Heartland Institute as president from long-time president and CEO Joseph Bast, who co-founded Heartland in 1984. Bast served as executive director then as president & CEO until January 2018 and still acts as a Director and Senior Fellow at The Heartland Institute. Bast’s research and writing focus on climate change and energy policy these days. 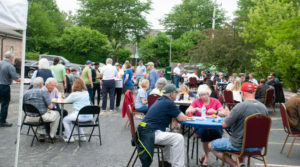 The main event took place on the back parking lot of The Heartland Institute located at 3939 N. Wilke Road in Arlington Heights, Illinois, where tables were set up for guests to enjoy picnic fare provided by TastyCatering.com. It was there that Heartland staff and friends of liberty intermingled – meeting and greeting old friends, and making new friends before the official program began. Former Congressman Joe Walsh, a nationally syndicated radio host based at AM560 The Answer, served as the MC for the occasion. Three booths for guests to explore were in the Andrew Breitbart Freedom Center, accessible from Heartland’s back parking lot. Watch at this link a video of then President and CEO Joe Bast talking about Heartland honoring Andrew Breitbart. Booth 1: A dual purpose booth featuring the Homeowners Defense Association (HDA), which is proposing a 1 percent tax cap referendum for the November 2018 Illinois ballot to help preserve the dream of homeownership for many struggling Illinois taxpayers. For years, Illinois homeowners have seen their property tax bills climb at a rate higher than their paycheck and inflation. Also highlighted was information about how to subscribe to the Local Government Information Services chain of newspapers, a series of local newspapers across Illinois which hold governments accountable, one county at a time, as an alternative to the liberal media. Booth 2: Appropriately called the “Joe Walsh” booth where Walsh T-shirts could be purchased. Booth 3: Promoted Chicago’s talk radio station WIND AM560 The Answer, with a weekday line-up featuring Dan Proft & Amy Jacobson, Joe Walsh, Mike Gallagher, Dennis Prager, Sean Hannity, and Larry Elder. Although the afternoon was on the cool side and somewhat gloomy without the sun to add overhead sparkle to the occasion, those attending exhibited a festive spirit which never diminished throughout the afternoon. Breaking the union stranglehold on public schools. Getting government out of all health care choices. Promotion of real science when it comes to the climate. Joe Walsh let it be known that even though he sometimes gets angry at President Trump, he’s still thankful Hillary did not win. “Keeping Hillary out there talking is a good thing.” In no uncertain terms, Walsh let it be known that he just wants our country back, and the only way to do so is for we the people to stand up and demand it. Walsh predicted that things could get ugly in nine or 10 years should millions of Americans rise up to take their nation back. Walsh bemoaned how half the country doesn’t even recognize the names of Madison, Jefferson, Adam as Founding Fathers or the principles upon which this nation was founded. Click here for a video of highlights of Joe Walsh’s speech at Heartland’s picnic for freedom. Walsh went on to describe Trump’s election as a “punch in the face” to our political system, not any more than that! Trump will be in office two more or six more years at the most, and that’s it. If this nation doesn’t wake up to embrace freedom, Walsh said, when Trump leaves office this country will return to the same globalist policies (one world government establishment) as demanded by the elites, for whom socialism is their desired goal for America. 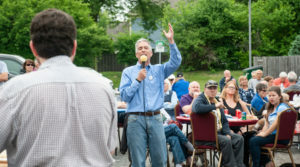 In turning the program over to Heartland’s president, Tim Huelskamp, Walsh reflected on the existing friendship between the both of them – having come into Congress together in the Tea Party revolution of 2010 – and the good fortune for Heartland to have brought them together again. (NOTE: Joe Walsh one of the first employees of The Heartland Institute in the mid-80s.) As Walsh explained: Tim Huelskamp survived four more years after he left for a total of six years – and took a lot of abuse from the GOP Establishment that he doesn’t talk about much. Tim Huelskamp likewise expressed amazement that he and Joe would meet up again through Heartland. Not missing a beat, Dr. Huelskamp revealed that Washington, D.C. is worse than it even looks. 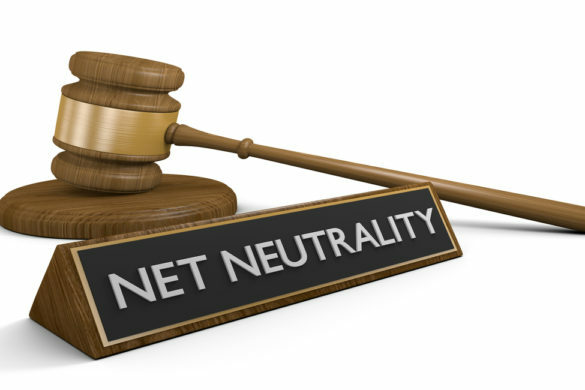 “So many legislators are out of touch and this includes state legislators,” Huelskamp said. 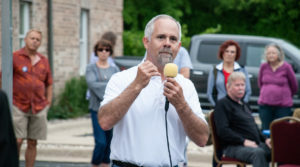 “They don’t understand what built America.” Huelskamp believes government is not the answer to freedom, but the problem. On the issue of climate, Tim Huelskamp sees no problem with CO2. Heartland, as the world’s most vocal critic of the hypothesis man-made, catastrophic climate change, believes in Energy Freedom and is fighting back against Tom Steyer as he uses his wealth to advance bogus climate claims. As stated by Huelskamp: “Steyer will outspend Heartland 100-to-1, but we know we will win because Heartland is right.” Tom Steyer is a billionaire on a mission to save the planet from Trump. His organization, NextGen Climate, has spent $170 million over the past four years advocating for policies and politicians push climate alarmism and advance renewable energy. Like our Founding Fathers, Tim Huelskamp believes Washington, D.C. should be limited in power. Accordingly, Heartland efforts are directed at the state level where change is possible – a rarity, as most organizations direct their efforts toward Washington. Heartland prides itself on sending out three monthly policy newspapers – Budget & Tax News, Environment & Climate News, and School Reform News – to every national and state elected officials in the United States and thousands of civic and business leaders. State by state Heartland is making a difference, in keeping with Heartland’s mission to save this nation and our country. The event concluded with a raffle of three prizes awarded to the lucky holders of winning tickets sold throughout the event, although many guests did linger for a while longer. As I left the event, I was already thinking ahead to next year’s Fourth Annual Picnic for Freedom.